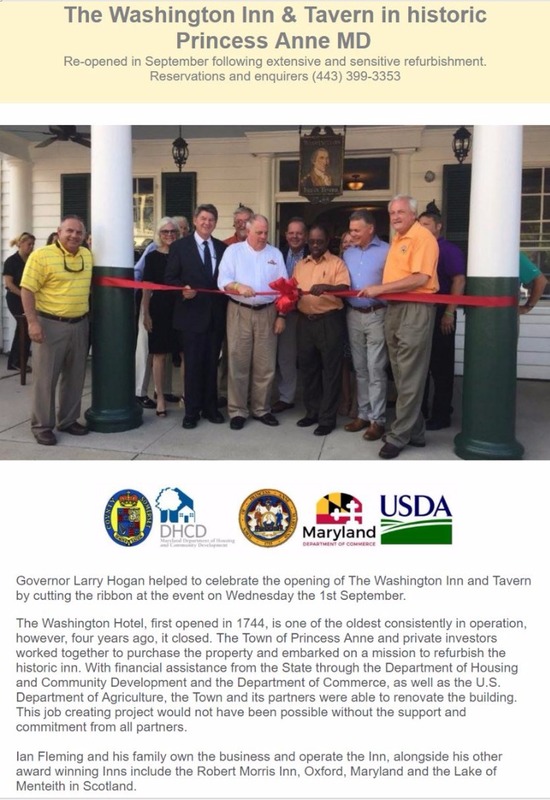 The Washington Inn and Tavern has been the center of the community ever since, over 270 years of hospitality, serving travelers and the community and the second oldest Inn in the State. The Town of Princess Anne exemplifies Historic Small Town America. This hamlet at the head of the Manokin River was named for Princess Anne of Great Britain, daughter of King George II. Established in 1733 and serves as the county seat for Somerset County, the southernmost county in Maryland. The Inn was built in 1744 and has been the center of the community ever since. It is believed that George Washington stayed at the Inn several times during his wide travels across the state, his family and that of his wife came from Virginia. The Inn was named in his honor. Room 2 is likely to be where he stayed as it is the largest of the original historic rooms and the only one to have its own balcony over the front porch. The ladies and gentleman's separate staircases are a very rare feature and it is said for the protection of the lady's modesty ascending the stairs. Reputed to be a busy staircase, even when there are no guests staying . . . .
Bicycles and Kayaks may be rented in advance, ready for your arrival. Our Tavern and Dining Rooms offer a historic homey atmosphere with ancient timbers and log burning fires in cooler months, a firm favorite with locals and visitors alike. 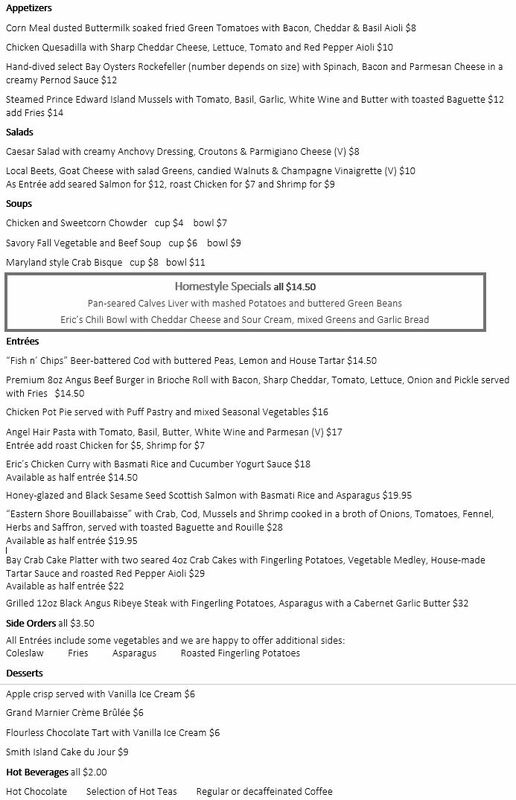 Real food at tasty prices using fresh ingredients and featuring traditional favorites, Eastern Shore specials and friendly service. Private spaces available from our fireside Alcove table for 8, to our Dining Rooms for up to 25 and Lounge for up to 50. Open for Breakfast seven days 7.30 am to 10.30 am, lunch 5 days 11.30 pm to 2.30 pm and Dinner 4.30 pm to 9 pm Wednesday through Sunday, Tavern closed Lunch and Dinner Monday and Tuesday. A University Town, home to the University of Maryland Eastern Shore which is a central figure in the community, enhancing the cultural and economic life of Princess Anne, Somerset County, and the lower Eastern Shore. Moreover, it is visited by researchers, scholars, and artists from around the globe. Located on Route 13 yet only fifteen minutes drive south of The City of Salisbury, the area overflows with attractions and amenities, yet still keeps a quiet rural charm and a home-town feel. One of the greatest local attractions is, of course - the Atlantic Beaches which include Ocean City, Maryland, Assateague (35 miles), Chincoteague (35 miles), Rehoboth, Bethany Beach and Fenwick Island. 25 minutes, 19 miles from Princess Anne is the Seafood Capital City of Crisfield. Initially a small fishing village called Annemessex Neck, during European colonization, it was renamed Somers Cove, after Benjamin Summers. When the business potential for seafood was discovered, John W. Crisfield decided to bring the Pennsylvania Railroad to Crisfield, and the quiet fishing town grew. Crisfield is also a major gateway to Smith Island and Tangier Island both unique Bay Island worth a day trip. As the county seat, Princess Anne is the ideal starting point for day trips to the Lower Eastern Shore. History buffs and antique lovers will want to explore the town, and take advantage of the many unique shopping and dining experiences available. A self-guided walking tour features 36 historic buildings, all within a ten-block radius, which is highlighted by Teackle Mansion, a magnificent five-part brick house built by Littleton Dennis Teackle.